OnePlus 5 is perhaps the most sought after device at the moment. And if you were not able to buy the device when it was launched on June 22nd, don't worry. The OnePlus 5 is available for purchase via open sales permanently from today, in India, US, and every Country where it will be sold.You cam choose either variant, the 6GB RAM with 64GB storage, or the 8GB RAM with 128GB storage. If optical image stabilization is a must for you, then you might want to skip the OnePlus 5, but it does have EIS which does a fairly decent job.Overall, it is a good device, except for the price tag. While the OnePlus 5 retails for $479 (approx Rs. 30,800) in the rest of the world., for some reason it is priced at Rs. 32 999 in India, which is $512. We have no clue why there is a huge difference in the price in our Country. But that hasn’t deterred Indian fans from buying the OnePlus 5, and the device has garnered over 500 reviews on Amazon India already, and has a 4.5 star rating. There are several camera samples posted there as well, so if you want to check them out, you can do that. And don't forget, you can get a flat Rs. 1500 cashback, if you buy the OnePlus 5 using an SBI Debit or Credit Card. 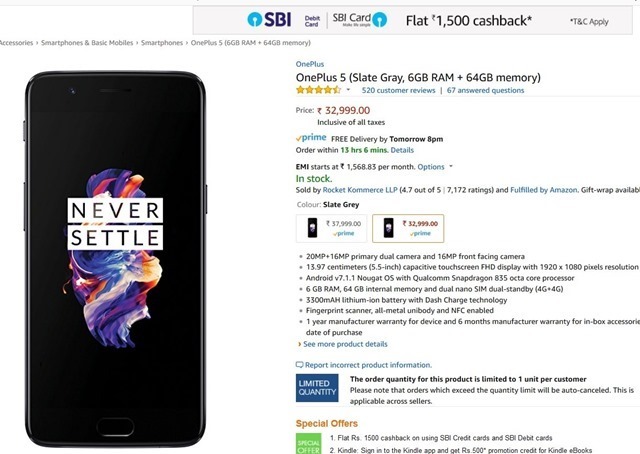 This offer is available on Amazon India and also on the OnePlus India's website. 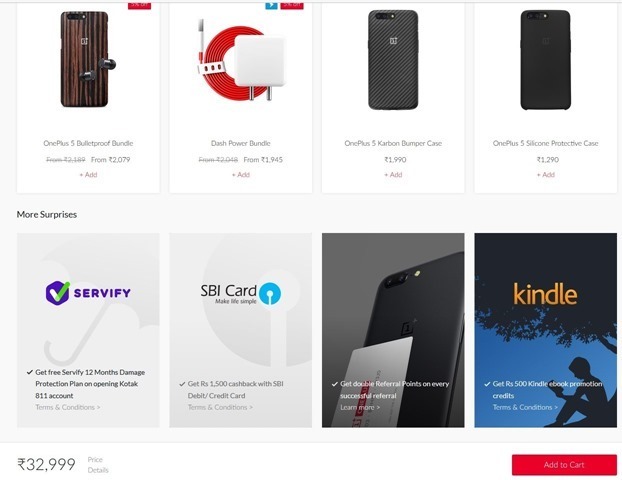 There are a couple of other offers on OnePlusStore.in, like the case and headPhones bundle. So, you can choose whatever you like. Some people may prefer Amazon because of its Prime delivery service, and customer support. OnePlus 5 is now available for purchase globally. Here is a good cashback offer for Indian users.